This article contains fast, interesting, fun facts about Imhotep for research, schools, students and kids providing an insight into the lives and religious beliefs of the ancient Egyptians. He was the greatest Egyptian, many say a genius, a brilliant man whose expertise spans a significant number of different subjects including architecture, astrology, medicine and engineering. He was born a commoner in ancient Egypt but rose to become was chief architect to the Egyptian pharaoh Djoser (reigned c.2630 - c.2611 BC), the high priest of the sun-god Ra at Heliopolis, the "City of the Sun". The sun temple of Heliopolis was amongst the most important religious cult centres of ancient Egypt. Over 10,000 priests and slaves served in the massive temple of Ra, which also served as a library. Heliopolis was the center of learning in the ancient world, with schools of theology, science, history, medicine, astronomy and philosophy. He lived and died as a mortal man during the period of history known as the Old Kingdom but his legacy and reputation lived on after his death and hundreds of years later in the period known as the New Kingdom (1550 -1069 BCE) he was venerated as the patron of scribes, personifying wisdom and education. He received his final accolade in the Late Period (664 - 332 BCE) when he was deified c525BC at Memphis as the god medicine and healing. 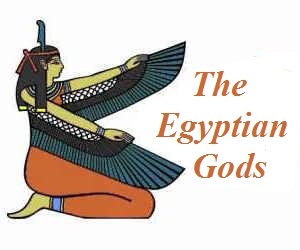 The fall of the Egyptian Empire at the hands of the Greeks and the Romans did not see the fall of Imhotep as they continued to build temples to him. His Greek counterpart was Asclepius and his Roman counterpart was Aesculapius. The Egyptian priests said that he was the son of Ptah and the war goddess Sekhmet. So how did this ordinary Egyptian reach such exalted heights? Details of his early life are limited but he was the son of a wealthy family and clearly given an excellent education and was able to write in hieroglyphics. Only 1% of the Egyptian population had this ability. Facts and information about Imhotep for kids with some amazing, cool and quick information about ancient Egypt and Egyptians. These fast interesting facts about Imhotep are ideal for children, homework, schools, teachers and kids of all ages. 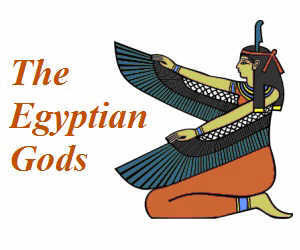 Learn about the ancient Egyptian gods and Imhotep the fast and easy way via the Imhotep Fact sheet. He was believed to have been born in Ankhtowe, located close to Memphis in Lower Egypt, although others believe his place of birth was Gebelein, south of Ancient Thebes in Upper Egypt. We do know that King Djoser made Memphis the capital of Egypt, the position it held throughout the time period of the Old Kingdom. The exact date of his birth is unknown but we know that he lived during the reign of King Djoser (reigned 2668 - 2649 BC) of the 3rd dynasty of Egyptian rulers in the time period known as the Old Kingdom, which would become known as the 'Age of the Pyramids'. The name of his father was Kanofer, who was a celebrated architect. The name of his mother was Khreduonkh. 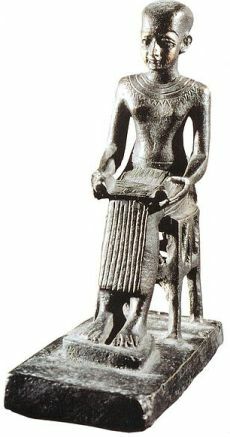 His statues portray him as a studious man with a scribal papyrus in his lap. His superior intellect led him to the royal court of Egypt. A 3rd Dynasty stele contains a list of his titles, including "Chancellor of the King of Lower Egypt; First after the King of Upper Egypt; Administrator of the Great Palace; Hereditary nobleman; High Priest of Heliopolis; Builder; Chief Carpenter; Chief Sculptor and Maker of Vases in Chief." Vase making was clearly a considerable post in ancient Egypt. In ancient Egypt the highest-ranking government official, appointed by the king and acting as his chancellor is now called vizier. He was therefore an important political, religious and practical advisor of King Djoser. He clearly had extensive knowledge of architecture and designed the famous step pyramid at Saqqara. It was the first pyramid constructed in Egypt and the prototype of all pyramid complexes. The Step Pyramid at Saqqara is one of the most brilliant architecture wonders of the ancient world and is recognized as the first monumental stone structure. A building of the size of the Step Pyramid and made entirely out of stone had never before been constructed. He was of such importance that he was given the unprecedented honor of being mentioned on statues of king Djoser in his necropolis at Saqqara. As a high priest he was fully conversant with ancient magical practices and rituals of ancient Egypt and had access to the secret libraries that were attached to the Egyptian temples. He was therefore also acknowledged as a powerful magician. It is believed that Imhotep was mentioned in the also famous Papyrus Westcar, in a story called "Khufu and the magicians". However, the papyrus is badly damaged at the beginning and reference to the magician's name has been lost. His reputation as a great magician who knew the secret words of power from his knowledge of versions of ancient religious compositions would have aided his role as a physician. Magic, medicine, healing and religion were an integral part of everyday life in ancient Egypt. The ancient Egyptians believed that sorcerers caused illnesses, accidents and infertility and before any practical treatment was given to a patient various magic rituals and incantations were performed by priests as part of treatment forming an integrated therapy for both physical and spiritual health. The mix of magic and medicine was also evident as a medical kit would also include various amulets and magical charms. Medical wisdom records were kept in the temples detailing knowledge of healing, diagnosis, medical procedures and remedies. Many believe that the writings of Imhotep in a reference manuscript contributed to the 'Edwin Smith papyrus'. The 'Edwin Smith papyrus' presents a rational and scientific approach to medicine in Ancient Egypt, and contains anatomical observations, ailments, and cures, although accompanied by some magic spells. As the god of medicine and healing sick people believed that sleeping in his temples would help the healing process and that the god would reveal remedies to them in dreams. The Reed leaf with legs in hieroglyphics means 'come', the owl represents the letter 'M', the bread loaf on mat is the phonetic form for htp and an ideogram for contentment, the next symbol is the semi-phonetic 't' and the square shape represents a stool made out of reed. He is believed to have died c2648 BCE. He was the greatest of all Egyptians - unfortunately his name was used for the evil, merciless high priest as the title character of the 1999 movie, 'The Mummy'. The survival of the name, or Ren, was imperative to the Ancient Egyptians as they believed that the person would live for as long as the name was spoken. Although not born of royal blood Imhotep has achieved this goal.